A landmark that dates back to 1933, Tally’s Dockside is a quaint and charming paradise on the beautiful shoreline of White Bear Lake. Tally’s nostalgia and relaxing atmosphere provide patrons an opportunity to feel like they are on a cabin vacation. Whether renting a boat, enjoying the breeze while having lunch or dinner on the deck or catching a live music performance, Tally’s Dockside provides the ultimate escape from reality. For decades Tally’s Dockside mission is to “take in the splendor of White Bear Lake and enjoy the boathouse, BBQ restaurant, marina and pub – Life here is ‘Spagnanamous’.” For this “Hump Day Lunch Day” we feature an array of beer from Deschutes Brewery paired with Tally’s in-house slow cooked BBQ the “Ole Timey Memphis Way” to coincide with the Deschutes Tap Invasion on July 8th. Click HERE for details of the event! For starters we ordered Yardbird on a Skin. This appetizer is goodness to share! 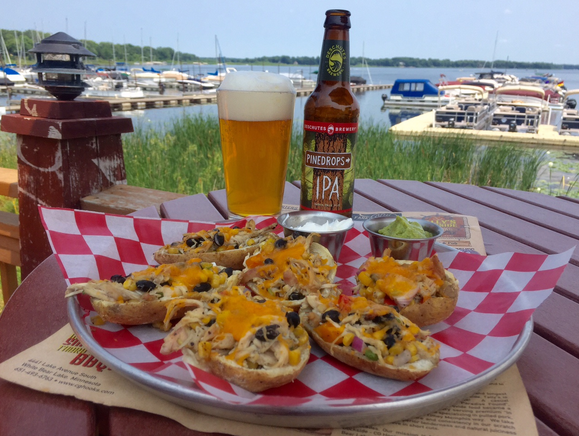 Potato skins filled with slow smoked pulled BBQ chicken topped with home smoked corn salsa, shredded cheese and served with a side of guacamole and sour cream. The chicken in the dish is prepared perfectly smoked for three hours giving a nice smokiness on the palate. The corn salsa provides a nice kick to the dish delivering the perfect amount of heat. We paired this dish we Deschutes latest year-round offering Pinedrops IPA. Pinedrops IPA is a lively IPA that delivers a crisp and light malt body with ample citrus and pine notes from Chinook and Equinox hops. The hint of pine coming from Pinedrops IPA and the smoke character in the dish provide the perfect compliment to one another. Along with the beautiful weather on the lake, this is the perfect pairing for starters. In the mood for a dog? Hooks Coney Dog will hit the spot! Hooks Coney Dogs are all beef prepped on Tally’s smoker and is piled with their signature Bob’s beans, pepper jack cheese and topped with chopped onions. 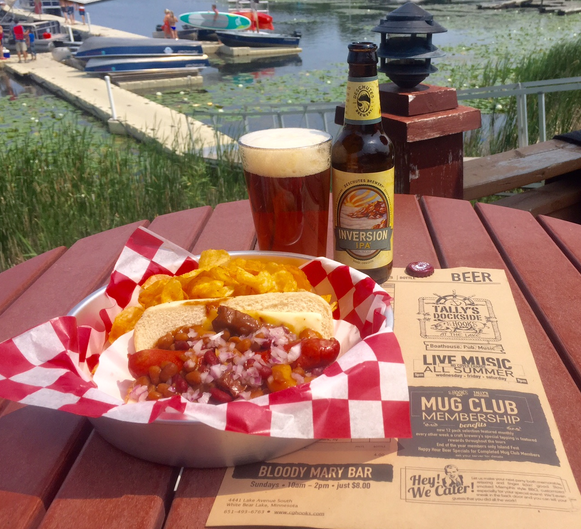 We paired the Hooks Coney Dog with a staple from Deschutes Brewery, Inversion IPA. Just like clear days up on the White Bear Lake, Inversion I.P.A. will deliver a path to easy living. Inversion I.P.A. is a phenomenal NW-style I.P.A., beckoning all beer drinkers and enticing I.P.A. lovers to invert their world and find clarity above the routine of the everyday. With the many flavors in Hooks Coney Dog, Inversion IPA comes through cleansing the palate and leaving you desiring another bite of the dog. This harmonious pairing is absolutely outstanding if your looking for a quick and easy bite to eat on the deck of Tally’s Dockside. Hungry? Tally’s Dockside has the perfect platter for you. The Ultimate Porker Plate is compiled of Tally’s famous slow smoked meats, pulled pork, beef brisket and chicken piled on grilled Texas toast with the ultimate four BBQ ribs. The Ultimate Porker Plate is also served with a side of smoked gouda mac ‘n cheese, a three bean blend mixed with molasses sweet and brisket for additional flavor and cornbread prepared in a fish style cast iron mold (Don’t worry, no fish we harmed in the making of the cornbread). 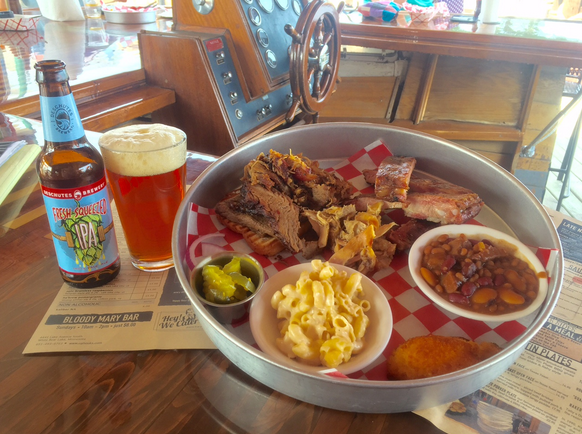 The Ultimate Porker Plate is loaded with flavor and there is no better beer to stand up this dish than Deschutes Fresh Squeezed IPA. This mouthwateringly delicious IPA gets its flavor from a heavy helping of citra and mosaic hops. The citrus quality in Fresh Squeezed IPA scrubs your tongue refreshing the palate and gets you ready for your next meat of choice. Taking a sip of beer after each bite will let you enjoy each meat of the dish separately providing numerous flavors in one large meal. This is a exceptional pairing leaves hand in hand at the end of the meal. A fairy tale ending to ‘Hump Day Lunch Day’. If you want to add a little extra kick to your dish, Tally’s Dockside homemade BBQ sauce will explode with flavor in your mouth. 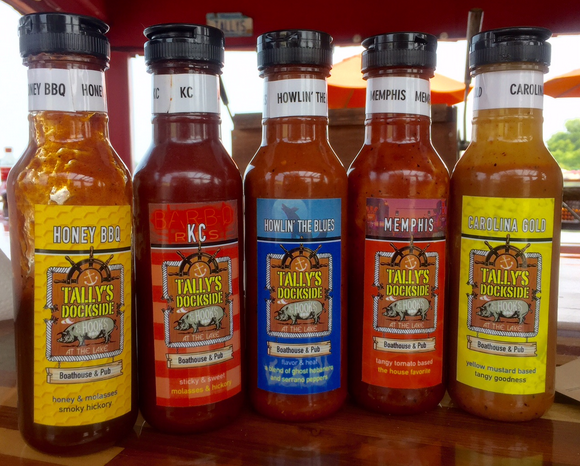 With five different options to choose from, each BBQ sauce will add to your BBQ paradise on the deck of Tally’s Dockside. EVENT!!! 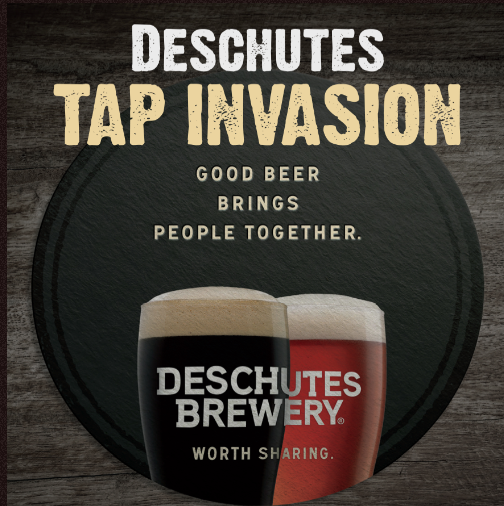 Try each beer and food pairing yourself at Tally’s Dockside on July 8th with a special tap invasion featuring Deschutes Brewery! Click HERE for event details. Find out more exciting events from J. J. Taylor here.